The renewal of diplomatic relations and the appointment of the first American ambassador to Libya in decades should facilitate the repatriation of the remains of Richard Somers and the men of the USS Intrepid. 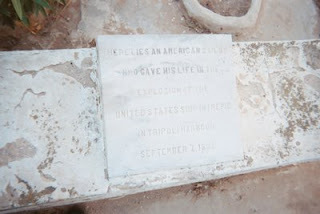 On September 5, 2008 Secretary of State Condi Rice became the first major American diplomat to visit Tripoli, 204 years to the day the bodies of Somers and his men washed ashore Tripoli harbor. They were buried in the shadow of the walls of the old castle fort by prisoners of the USS Philadelphia, who were being held for ransom. Those prisoners were eventually released, but the remains of Somers and his crew remained buried there in an unmarked grave until the 1930s, when Italian soldiers, while building a road, reburied five of the remains at the Old Prodestant Cemetery, about one mile east on the old coast road. 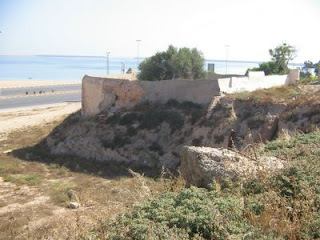 The military, the state department and the Congressional Research Service (CRS) have done reports on the cemetery site (41/1), apparently recommending that it be secured and remain intact, but none of these reports concern the original, unmarked grave site, which was reportedly identified by the Libyans and partially excavated with the discovery of “buttons and bones,” that were apparently replaced and the grave site resealed. Originally a park with paved paths winding around islands of plants and trees, the original grave area may have been paved over entirely, as it is now within a public area known as Green Square, a popular gathering place on holidays and for demonstrations. A military review has apparently concluded that the cemetery site should remain undisturbed, with the Libyans eventually granting the United States the same or similar gravesite maintenance arrangement that are in place with the French at Normandy, the Italians at Anzio and the Tunisians at Carthage, not far from Tripoli, under the administration of the American Battlefield Monument Administration (ABMA). In the meantime, the cemetery grave sites needs repairs to its walls, a proper survey and inventory of what is there, and the replacement of the American flag pole adjacent to the historical marker that reads: “Here lies an American sailor who gave his life in the explosion of the USS ship Intrepid in Tripoli Harbor, September 2 (Sic 4), 1804.” (See Photo attached). One mile away, the original grave site, in the shadows of the old castle fort, has not been properly identified or secured, and contains the remains of eight men of the USS Intrepid, including the three officers, Lieuts. Somers and Wordsworth and midshipman Israel. The American officials in Tripoli have requested the Libyans permit the U.S. Navy to conduct a proper survey of both grave sites, and New Jersey Sen. Frank Lautenberg has taken the lead in Congress ensuring the new agreements between Libya and the United States are upheld, holding up the appointment of the U.S. Ambassador and obtaining the final reparations for the families of the victims of Lockerbie. But Sen. Lautenberg, the new President and the next ambassador must be convinced that the repatriation of the remains of the American sailors in Tripoli should be a priority, and make it happen sooner than later, so a letter, fax, phone or email message could facilitate the process further. Please let Sen. Lautenberg know that you want the remains of our native son heroes returned and properly buried, and not laying in an unmarked grave under a parking lot in a foreign land. NO MENTION OF INTREPID - by former Navy pilot. A United States Congress delegation led by Senator John McCain arrived Tripoli on Thursday morning in a two-day visit to Great Jamahiriya. The delegation which also included Senator Joseph Lieberman, Senator Lindsay Graham, and Senator Susan Collins was welcomed at Ma'atiga International Airport by senior foreign affairs officials along with the staff of the American embassy in Tripoli. The delegation visited Lepts Magna on Thursday, 160km east of Tripoli on the Mediterranean coast. It also met with Libyan officials and discussed bilateral relations and cooperation between Libya and the USA. The four American Senators are members of the Republican Party and are well know for their strong support of the state of Israel, its policies of occupation and its rejection of making peace with Palestinians. The Senators have also been strong supporters of the American war on Iraq in which over one million Iraqi civilians have been killed so far, according to some media reports. Some of Senator Lieberman principal political positions in his country include: "Iraq [war] was a heroic struggle against enemies of civilization; Saddam was a threat; we did the right thing by invading; Not an inch of difference from Bush on Iraq and Pushing Israel out of West Bank is taking sides. TRIPOLI, Aug 14 (Reuters) - U.S. Republican Senator John McCain praised Libya's leader Muammar Gaddafi for his peacemaking role in Africa and said Congress would support expanding ties, Libyan state news agency Jana said on Friday. U.S.-Libyan relations have dramatically improved since Tripoli's decision in December 2003 to give up its weapons of mass destruction programmes, with diplomatic ties resuming in June 2004 after a break of more than two decades. "McCain and the delegation accompanying him confirmed the importance of expanding further the relations between Libya and the United States. The Congress would back the measures to be taken to achieve this aim," Jana said. It gave no details. Since Washington ended its major sanctions on Libya, U.S. energy companies including ExxonMobil and Chevron have been active in Libya. Jana made no mention of any comment by McCain, defeated by Barack Obama in the 2008 U.S. presidential election, about the possible release of Libyan agent Abdel Basset al-Megrahi, jailed in Britain for his role in blowing up a U.S. airliner in 1988 over Lockerbie, Scotland. Unconfirmed media reports this week said Scottish ministers were planning to release him on compassionate grounds because he is dying of prostate cancer. McCain, heading a four-member Congressional delegation, held talks with Gaddafi's son Mouatassim, the powerful national security adviser, before meeting Gaddafi himself. "Senator McCain and the delegation with him expressed their deep happiness to meet the leader and praised him for his wisdom and strategic vision to tackle issues of concern to the world and his efforts to sustain peace and stability in Africa," Jana said. Gaddafi is the chairman of the African Union and attended the July G8 summit of world leaders in Italy, where he met and shook hands with Obama. The United States designated Libya a "state sponsor of terrorism" in 1979, and President Ronald Reagan ordered Libyan assets in the United States frozen in January 1986. Relations sank further when the United States blamed Libya for the deadly bombing of a Berlin disco frequented by U.S. military personnel. U.S. aircraft bombed Tripoli, Benghazi and Gaddafi's home in April 1986, killing his adopted infant daughter. President George W. Bush formally ended the U.S. trade embargo in 2004, and Libya declared an end to confrontation with the United States in 2008. TRIPOLI, Libya -- A delegation of U.S. senators led by John McCain met with Libya's leader Friday to discuss the possible delivery of non-lethal defense equipment. The visit and Washington's offer of military equipment was another sign of the improving ties between the former longtime adversaries. "We discussed the possibility of moving ahead with the provision of non-lethal defense equipment to the government of Libya," McCain said at a news conference. He gave no details on the kind of military equipment Washington is offering. AP Photo - U.S Congressional Delegation from Washington D.C. Senator John McCain, second left, talks during a press conference at the U.S. Embassy in Tripoli, Libya Friday, Aug. 14, 2009, with Senator Joseph Lieberman, left, Senator Lindsay Graham, right, and Senator Susan Collins at the end of their visit to Tripoli. A halting, five-year rapprochement between the two countries began in 2003 when Moammar Gadhafi renounced terrorism and weapons of mass destruction. Earlier this year, Washington posted an ambassador to Libya for the first time in 36 years. Senator McCain, however, said the U.S. remained concerned about Libya's record on human rights and political reform. "As we move ahead with the many ways in which the United States and Libya can work together as partners, there remain areas where real work needs to be done," McCain said. "The status of human rights and political reform in Libya will remain a chief element of concern." The U.S. State Department's 2008 human rights report on Libya says problems include reported disappearances, torture, arbitrary arrests and the detention of political prisoners. The report also cites a lack of civil liberties, restrictions on freedom of religion and discrimination against women and ethnic minorities. Still, McCain said, "ties between the United States and Libya have taken a remarkable and positive turn in recent years." The American delegation also included Senators Joseph Lieberman, Susan Collins and Lindsey Graham. This portrait, recently offered for sale by someone related to the Barry family, is identified as being that of "Lt. Richard Somers," who was a close, personal friend of Captain John Barry. Somers was one of Barry's first Midshipman aboard the USS United States, and is a witness to Barry's last will and testiment. But the portrait, according to Somers' family and historians, does not appear to be Somers, whose facial physical features were described as being totally different. The portait, in fact, resembles Barry himself, as a young man, and could be his nephew or another naval associate, but it is probably not Lt. Richard Somers, Captain of the USS Intrepid when it exploded in Tripoli harbor on September 4, 1804. 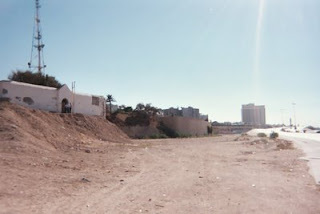 His remains are still burried on the grounds outside the Old Castle Fort at Tripoli harbor. This portrait, allegedly of Somers, is being sold along with another protrait, most certainly that of Captain John Barry, arguably the Father of the United States Navy. The only other bid to the title of Father of the US Navy, John Paul Jones, died in Paris, France, reportedly on a secret mission related to the war with the Barbary pirates, during which Somers gave his life. Barry was burried in an unmarked grave that was paved over by a road, and was only discovered by the persistent inquiry of an American diplomat stationed there. The remains of John Paul Jones were recovered and transported to Annapolis, Maryland, where they were reburried at the church at the US Naval Accademy, where midshipman are trained today. It appears that the remains of Somers, which have suffered a similar fate in Tripoli, will eventually be recovered and returned home for a proper burrial, like that of John Paul Jones. In leading the efforts in Congress seeking justice for the victims of terrorism, and in making the effort to resolve outstanding issues in the restoration of diplomatic relations with Libya, you are in a unique position to assist in the repatriation of the remains of New Jersey native Lt. Richard Somers and the crew of the USS Intrepid. They are the oldest POW/MP case on record and should be given priority attention. It is imperative that the representatives of the United States persuade the government of Libya to allow the United States Navy to inspect the original gravesite and for the US DOD POW/MP office to begin repatriations of the remains of these heroes. The government of Libya should also allow for the United States government, or a non-profit private foundation, to assume responsibility for the security and upkeep of both grave sites and maintain them after the repatriations are complete. Those men died fighting for the same ideals that our men and women fight and die for day, and the current resolutions of our differences is also the end of the hostilities that began over two centuries ago. Remember Lt. Somers and the men of the Intrepid. "This site holds great importance and is therefore under the protection according to the Law of Preservation of Antiquities. 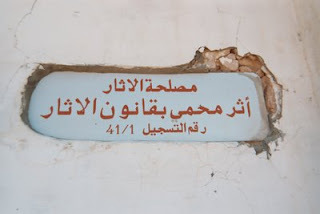 Site Registration Number: 41/1"
Many thanks to Ciqdem Gole for translating this for us. 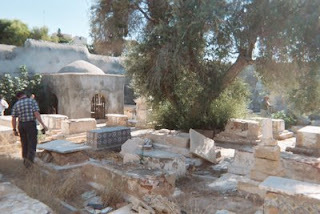 Here's the most recent photo we have of the cemetery gravesite in Tripoli. As can be seen on the map posted previously, and in the photo, the walled cemetery, a few centries old, is crumbling, though the Libyans have begun to build a park around the cemetery. It is located about one mile from the Old Castle Fort, 100 yards south of the main Coastal Highway. It is between the main center of the city and Wheelus Air Force Base, now the main airport. 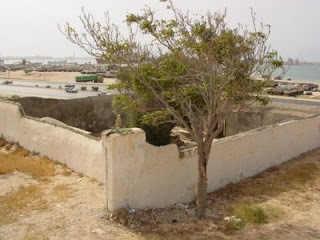 This cemetery site, which has been secured by the US Embassy personel, has the remains of five of the thrirteen men of the original USS INTREPID, which exploded in Tripoli Harbor on September 4, 1804, two hundred and four years to the day that Condi Rice became the first US diplomat to visit Tripoli in nearly 40 years. I'm also going to try to post a google map with a satelite photo of the site. 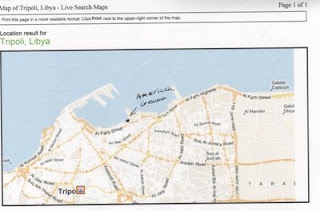 As on all good pirate maps, X Marks the Spot of the Old Prodestant Cemetery in Tripoli, which has also been called the American Cemetery. "It is unbelievable how much Tripoli has changed in the past 50+ years. at most. The expansion of development has easily quadrupled..."
ran along the shoreline from the old fortress at the west end of the harbor. and there were several hotels that had been built by the Italians. Beyond that point there were mostly small single family dwellings. I Recall that the cemetery was not far from where the road to Suk-El-Guima began." the base. Now there is a freeway that goes out to the Air Base and beyond. Coddringron, a close friend of Jacques Cousteau. Myself and the late Sgt. when he visited Tripoli with the Cruiser Glasgow. Lots of great memories.